It’s official. Spring has arrived. What a great reason to get out and enjoy some enchanting sites on foot or bicycle. Driving is an option too! 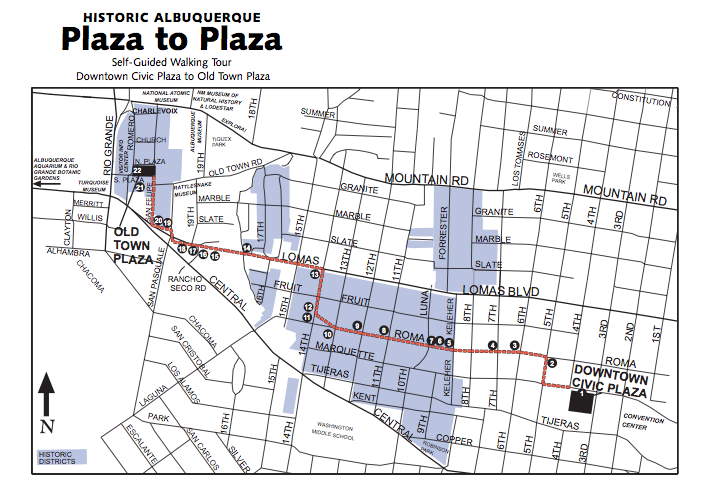 The Albuquerque Convention & Visitors Bureau has assembled a number of handy printable guides that provide insight to the city’s neighborhoods and historic architecture. Consider using these guides to help inform your next self-guided tour. Learn about the history and architecture of the city, from Spanish colonial days to the railroad era, the coming of Route 66 and Downtown revitalization as you stroll from Downtown to Old Town or vice-versa. In the Southwest, the cubistic forms of traditional Pueblos were merged with Spanish Mission architecture and decorative motifs derived from Navajo textiles, Zuni pottery — as well as art from other Pueblos — to create a unique style: Pueblo Deco. Explore this unique architectural form best exemplified in some of Albuquerque’s buildings. ← What is your favorite “green” building in New Mexico? I’m so happy that spring has arrived. Time for a walk in the hood.